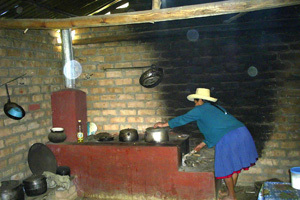 Energy-saving stoves for Peru collaboration with charity cat. Bambamarca is a province in the northern part of the Andes in Peru at about 2000 to 4500 meters sea level with a very cliffy landscape. While there are 6000 residents in Pueblo, a small town with the center of administration and school, there are about 95,000 Campesinos living in the periphery in the mountains. About 75% of the Campensinos are mini farmers which is not enough to support a family. 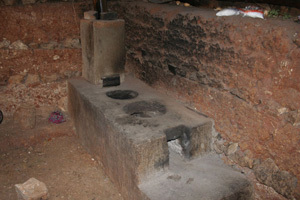 Due to the extreme excess of population there is not enough food, potable water and wood which is necessary for cooking. The traditional cottages of the Campensinos only have one room without windows and they cook on a fire place which is made of 3 stones on the ground. The smoke causes severe ophthalmitis , airway and lung diseases and little children burn themselves on the fire. About 30 years ago Herbert Eichenlaub, a German development aid worker, developed a stove which is easy to build. It only needs a third of wood, heats the pot very fast and diverts the smoke outside. It is higher which reduces the risk for the children and no dirt can fall into the pot. 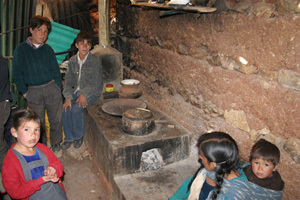 About 5 years ago those stoves were initiated in Bambamarca by the Förderkreis Cajamarca e.V. called “Asociacion Jose Dammert Bellido”. The material costs for one stove are about € 40.– and the families have to assist by producing around 50 Adobe stones (sun dried earth stones). Over the last years 300 energy-saving stoves were built and “Asociacion Jose Dammert Bellido” supported 50 stoves. In the meantime there is such a high demand for these stoves that they trained 8 women who drive the project in the outlying villages. Since 2008 Charity Cat has supported this project by financing 25 stoves and also provided soccer shirts, pants, socks, soccer balls, volley balls and pumps for various schools in that region. Based on the good experiences we have with this organisation we decided to support the construction of aqueducts in Bambamarca in 2010.